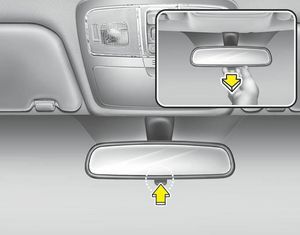 Adjust the rearview mirror to center on the view through the rear window. Make this adjustment before you start driving. Pull the day/night lever toward you to reduce glare from the headlights of vehicles behind you during night driving. Remember that you lose some rearview clarity in the night position.